As we were leaving the restaurant where we had dinner, the most beautiful rainbow came to life in the sky. It was a full rainbow with both ends touching the earth. My daughter was taking pictures as I was driving. I was reminded of a couple of things as I viewed the colored wonder. First, I remembered that God had given the rainbow to Noah as a promise that he will never again destroy the entire earth by flood. It was to be a sign of God’s faithfulness to keep his promise. Then I was amazed at how vivid this particular rainbow appeared. God is a master artist. He can paint the finest hint of a rainbow in the sky like many I have seen before or he can use full color as he did with this one. There are times in our lives that he does the same. He gently lets us know that he hasn’t forgotten us and still there are other times that he boldly declares that he is in the midst of our situation. I am also aware that I could have missed seeing the rainbow as I have many times before. Had I been at the wrong place or not paying attention I could have missed it altogether. 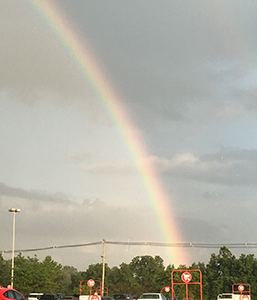 The rainbow is not the only sign of God’s faithfulness that he gives. I wonder how many times we miss the other signs. Did things just somehow manage to work out in the nick of time? Are we comforted by a friend that we weren’t expecting to see? Do we just happen to read a scripture that speaks to our situation when we need it the most? God uses these and a million other things to remind us of his faithfulness and many times we don’t give him the credit he is due. Just as we take a moment to look and be reminded of God’s promise when we see a rainbow, I hope we can look at our lives and be reminded that he is there too.